LOOKING FOR TRIPSDALE EXPEDITION PREMIUM FOOTWEAR WAX? JUST CLICK THIS LINK. 20.11.14 Water race still in use. 10.7.13 New trip - Tripsdale Head and East Bank Rise. 29.7.12 New trip — bracken at its worst. 18.5.12 AJ Brown's dates of birth and death, and sales particulars of his last home. 9.4.12 Walk in lower Tripsdale. 8.3.12 Walk in upper Tripsdale and North Gill. Plaque at Low Cable Stone marks Tom Scott Burns' life. 30.12.11 Tom Scott Burns dies. 8.4.11 1940s picture of Whitfield House supplied by Mr John White. 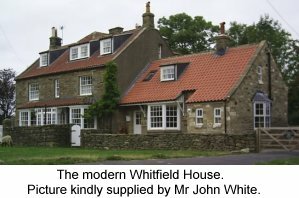 5.4.11 Authentic modern picture of Whitfield House supplied by Mr John White. 28.2.11 First draft of Topography notes and mao. 27.2.11 Scarborough RA Sunday walk. Separate Photo Gallery page for general pics. 26.2.11 Riveaulx House pic added. Fox and Hounds map modified. 22.2.11 Riveaulx House identified. First trip to Upper Cable Stone. 15.2.11 Literals corrected and map added to 26.1.11 report. 14.2.11 Notes on tributary becks clarified. Hyperlinks added. Incorrect map of East Bank Rise replaced with correct version. 5.2.11 Name of Low Cable Stones applied consistently. Page solely on tripsdale.co.uk domain. 4.2.11 New section on Tom Scott Burns. New section on Tarn Hole. Date of Tripsdale cobbler's activities fixed more accurately. 1.2.11 More news of AJB plaque. 22.1.11 AJ Brown's hotel identified. 2.1.11 Updates to Water Races. he is as on a high and lonely moor. - AJ Brown (1894-1969). Tripsdale, a side valley off Bilsdale, North Yorkshire, intrigued me when I first looked down on it from Nab Ridge, its western guardian. This compact dale is little visited and sketchily documented, and much of it presents physical access difficulties. 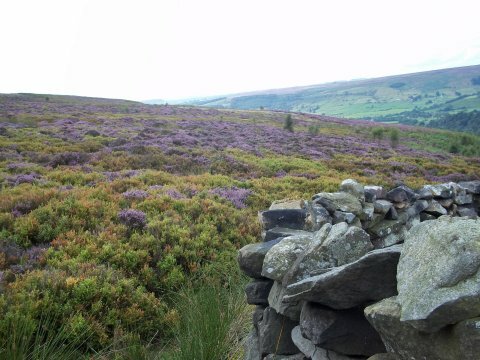 There are few trodden paths once visitors leave the pastoral southern approach from Bilsdale, and crossing much of the terrain requires wading through heather or fighting bracken, particularly in summer. 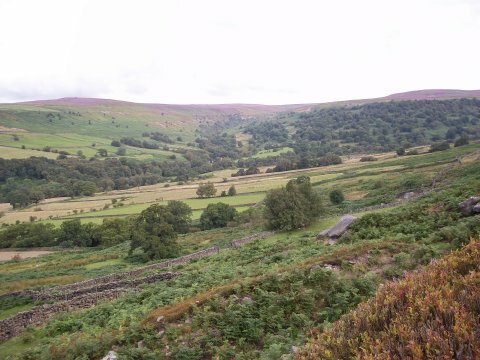 The upper dale is characterised by the very unusual steep canyons of Broad Ings, North Gill and Tripsdale itself. 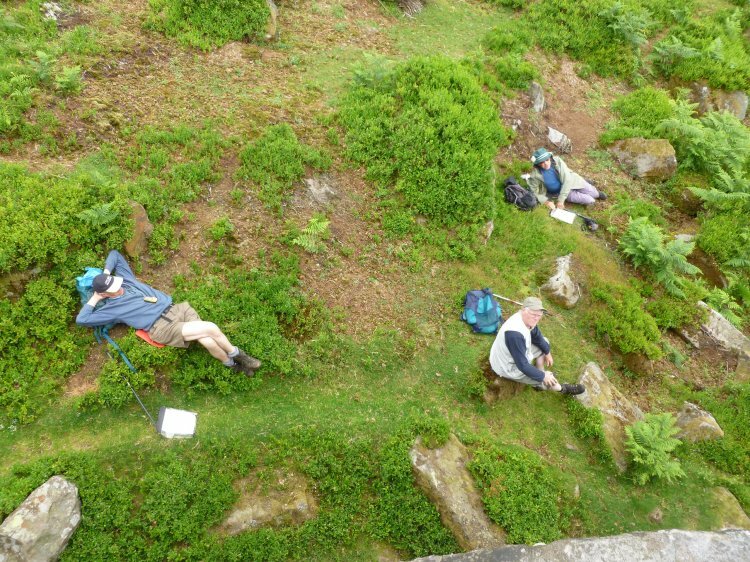 Some of the more accessible locations could be on the agenda for sociable Sunday rambles, but straying from these areas can be very tiring and demanding, and in particular terrains, falls, bangs and scrapes have to be accepted. The bracken can be surprisingly tenacious - on one occasion, a tangle snagged a gaiter so determinedly that when I tried to kick my leg free, the gaiter was torn apart. There are several hazardous areas where it would be foolhardy for a lone walker to persist, as there is no mobile telephone coverage and negligible likelihood of anyone passing within earshot. Nevertheless, Tripsdale can exercise a compulsive lure. 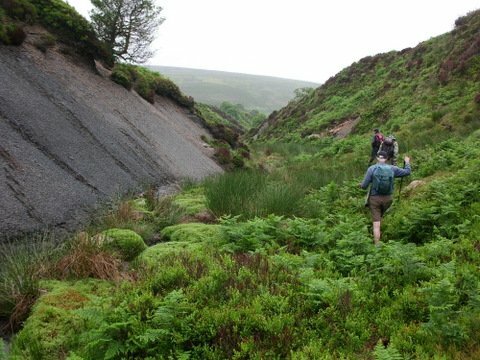 The Yorkshire walking writer, Tom Scott Burns, was another person with an enthusiasm for this fascinating valley. He called it "a real gem". Tripsdale is open access land, although frustratingly, much of one of its side valleys, Tarn Hole, is not. 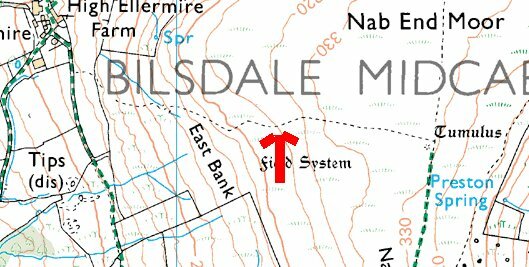 Tripsdale trends generally north-south, from Tripsdale Head at NZ59600 00120 to the emergence of Ledge Beck into Bilsdale at SE 57305 96180. 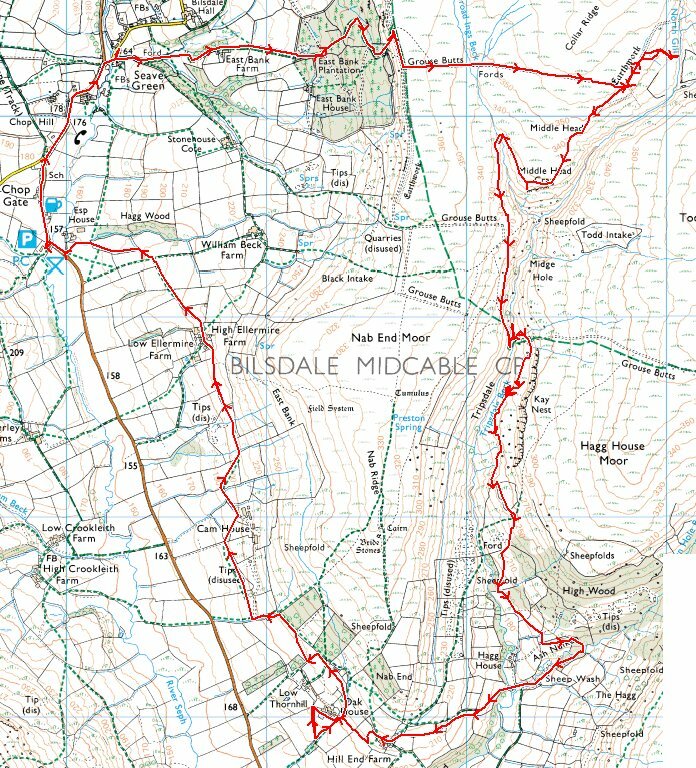 To the west it is separated from Bilsdale by East Bank/Nab Ridge, which provides a climb from Bilsdale that becomes gradually higher from south to north. 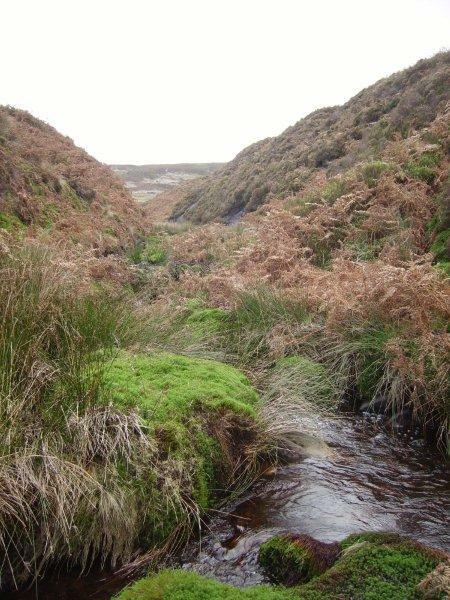 The far upper reaches of the Tripsdale drainage area are level, spongy heather moorland, feeding the main Tripsdale Beck and its first major tributary, Broad Ings Gill. These becks soon begin to cut steep-sided canyons, which meet beneath Middle Head Crag. The stream passage for about half a mile in each direction from this point provides a challenging passage for the leisure walker, with obstructions of rocks, fallen trees and lots of cold water. A crude concrete bridge, replacing a former ford at SE 58295 98835, carries a roughly-surfaced shooters' four-wheel vehicle track east-west, and the vast majority of walkers never leave this route. The track, while unsightly, does, however, give access to easy walking south, on the north side of the beck (from about SE 58337 98880) for about half the distance along middle Tripsdale (for the sake of convenience, this is defined as the area bordered to the east by the cliffs of Kay Nest). The remainder of this section can also be passed fairly easily outside the summer months, when it becomes heavily clogged with high bracken. To the west, the slopes of Nab Ridge offer a punishing scramble, the accomplishment of which has little point. Middle Tripsdale can be easily by-passed by continuing to follow the shooters' track east uphill from the bridge, then walking along the rim of Kay Nest to meet a public footpath. This descends west to a ford over Tripsdale Beck. Stepping stones were washed away (possibly in 2005) and the crossing can be very challenging in high water. In early 2011, a fallen tree offered a slightly less tricky crossing. 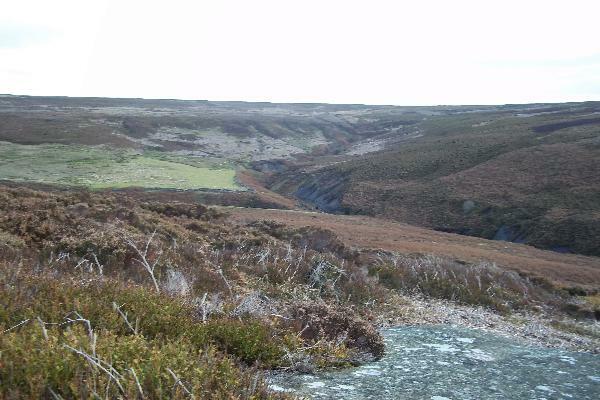 The problem was raised with North York Moors National Park in February 2011, but no improvements had been made by 10 July 2013. 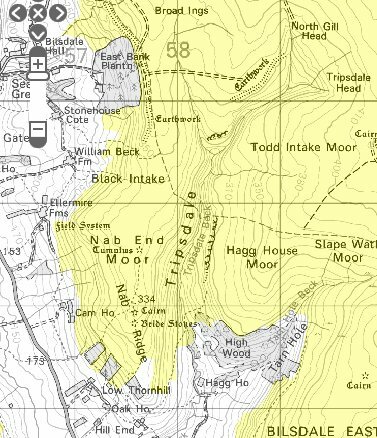 The alternative exit from Nab Ridge is to head south-east to ford Tarn Hole Beck (the other major tributary of Tripsdale), then exit along a good track to near Hagg House, but this involves the use of private land. 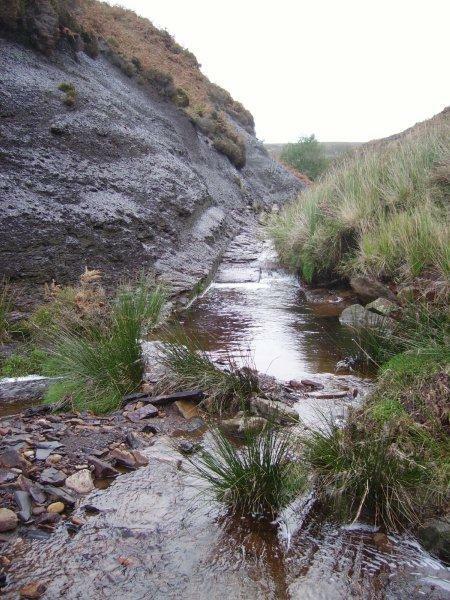 Tripsdale Beck merges with Tarn Hole Beck near Hagg House to form Ledge Beck, and public rights of way can be followed through pastoral lower Tripsdale to Bilsdale. 1 The Ship Stone: A huge rock that from one aspect has the appearance of the prow of a ship emerging from the waves. In the 19th Century a schoolmaster from a farming family carved a Latin inscription on it, adopting the title Bilsvallensis (a man of Bilsdale). Regrettably, one or two later visitors have seen fit to deface the rock with their own crude carvings. 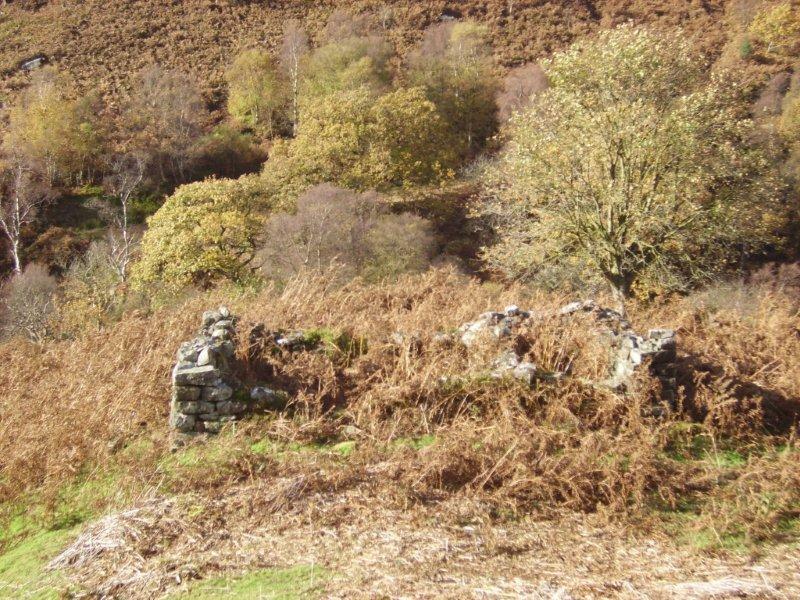 2 The cobbler's cottage: A ruin that once reportedly housed a cobbler who walked into Seave Green on Sundays and sat outside the Fox and Hounds Inn, offering his wares to people walking to and from church "in Urra". 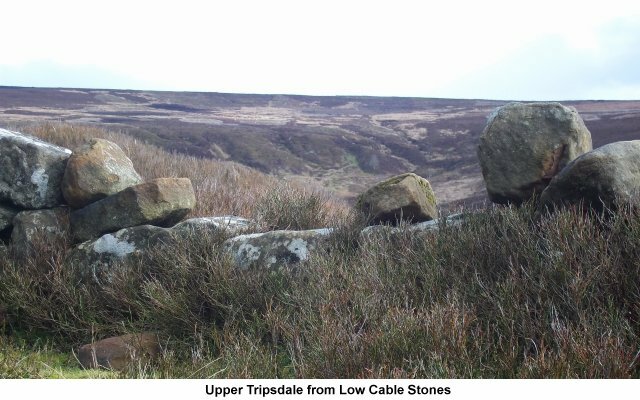 3 High and Low Cable Stones: Rocks in upper Tripsdale, Low Cable Stone has a plaque that once identified the Bradford home of Alfred J. Brown, an author of (among other matter) walking books on Yorkshire. Significant earthworks link the stones. 4 Kay Nest: A steep escarpment to the east, frequented by rock-climbers. 7...late 19th Century former jet quarries. 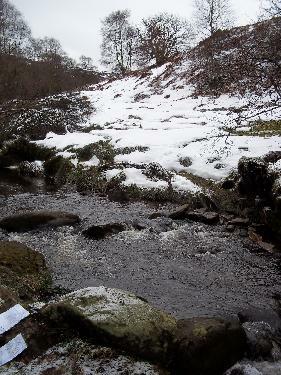 8 North Gill: One of two main tributary becks to Tripsdale Beck, which joins 240 yards east of Low Cable Stone. 9 Broad Ings Beck: The second main tributary to Tripsdale Beck, which joins below Middle Head Crag. 10 Tarn Hole: A subsidiary dale in lower Tripsdale. 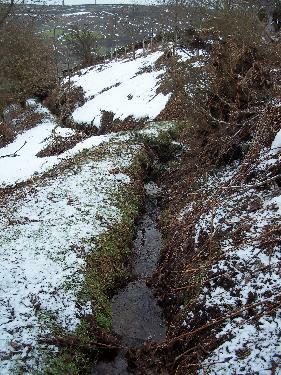 Tarn Hole Beck joins Tripsdale Beck near Hagg House to form Ledge Beck, which flows into Bilsdale. 11 Nab Ridge: The western edge of Tripsdale, which, as with Kay Nest to the east provides an overview of the valley. 12 Earthwork: Marked by OS in upper Tripsdale. 13 Water races: Two races by Joseph Foord were built in Tripsdale in Tripsdale in the late 18th Century. The short one from Preston Spring 57820 98447, still supplied Hill End Farm until at least the late 20th Century. 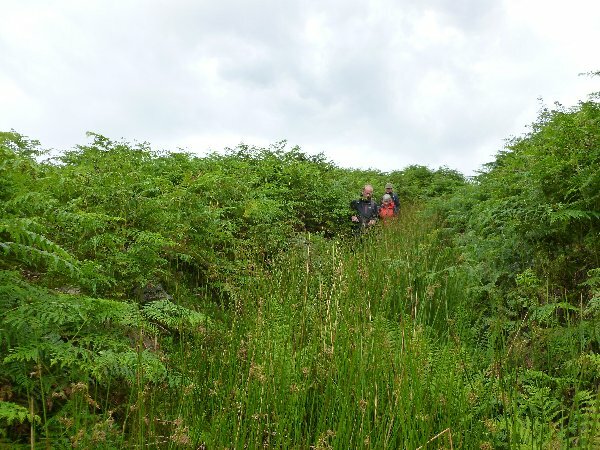 Although it is still functioning, recent inspection suggests that the water is not now used..
From late spring to early autumn, thick, high bracken provides a serious obstacle to progress in the southern part of the main dale. Where the bracken is absent, heather often offers a very tiring alternative surface. The cobbler sat outside the Fox and Hounds "at Seave Green", selling his wares to people walking to and from church "at Urra". 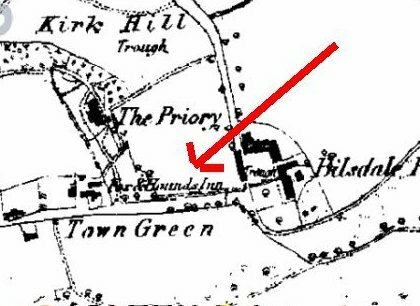 The Fox and Hounds Inn had disappeared from maps by the 1890s, but Ms Ida Atkinson of Bilsdale Study Group states that it appeared in other documents until at least 1913. In fact, the Fox and Hounds was in The Green (or Town Green) as Seave Green is properly the area between The Green and Chop Gate. The best estimate of the date of the cobbler's activities comes from Bits Of West Cleveland (John Fairfax Blakeborough, 1901) who states that the man had a stall outside the inn "about 80 years ago". Left: Location of the Fox and Hounds Inn from an 1858 1:10560 map. Left: Riveaulx House in 2011. The Ship Stone and cobbler's cottage shown in 1858. The cobbler's cottage in 1952. 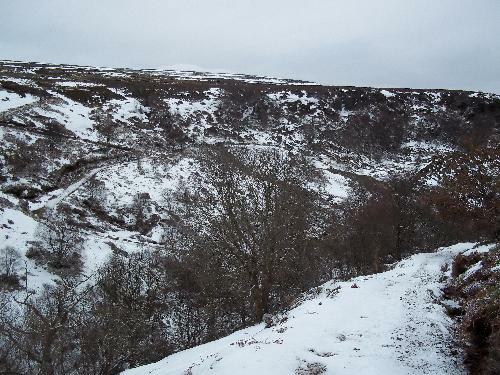 The earthworks, 10-12ft high and 4ft wide, run for about 600 yards, from Low Collar Ridge Spring in the south, past Low Cable Stone and High Cable Stone, to end suddenly at Cliff Dike, North Gill. There is a short branch running south-east from Low Cable Stone. According to A History Of Helmsley (1) "a deep hollow track winds up to it from Tripsdale". (I have observed (and followed to the streambed) an eroded feature that could once have been a track. There is a similar, longer feature, running parallel to it, about 100 yards north.) The History adds: "There are some old enclosures (walled) on the opposite side of Tripsdale Beck, but they seem later than those around Cable Stones...It is a curious set-up of earthworks, and only excavation could prove its construction and maybe its period." Presumably, the History is referring to the opposite side of North Gill, where the triangular enclosure is marked on older maps as "ledge". 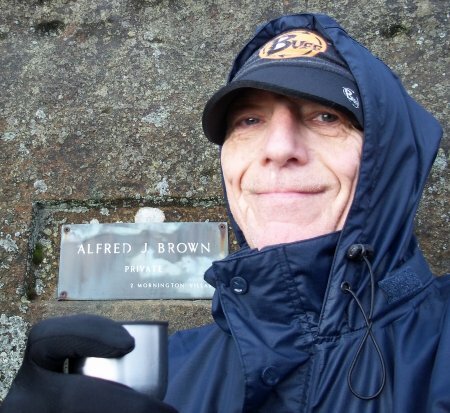 Fixed to Low Cable Stone is a plaque linked to the Yorkshire walking writer, Alfred (AJ) Brown. These earthworks are not, strictly, a Tripsdale feature, although they are of contextual interest as they run along much of the western ridge that overlooks the upper dale, as far as Middle Head Crag. The History of Helmsley and Rievaulx (1) describes them as "the finest example of a linear dike or earthwork". 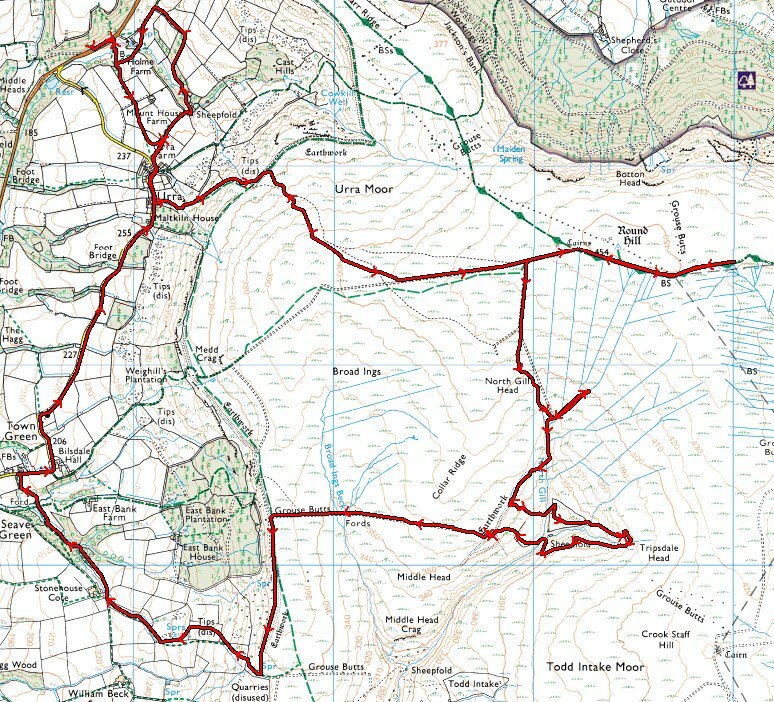 It runs for about three miles from near Clay Bank Top - "Hagg's Gate" - (close to the Cleveland Way) and past Medd Crag, to end opposite William Beck Farm. The History states that none of the earthworks have been dug. Typically, the bank is 4-7ft high and 10-12ft deep, often with dry stone walling on the western side. 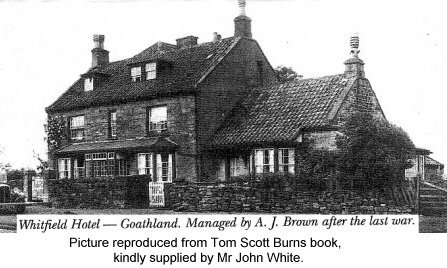 A plaque, said once to have been fixed outside the Bradford home of writer AJ Brown 21.8.1894-1.3.1969), is to be found on Low Cable Stones in upper Tripsdale. I inspected this plaque closely in February 2011, to assess the necessity/possibility of restoration or preservation. However, it has weathered very well, and appears to be made of some type of self-coloured perspex. Brown's books on walking in Yorkshire were originally published by Country Life magazine in the 1930s, and re-issued in updated editions at the end of the 1940s. 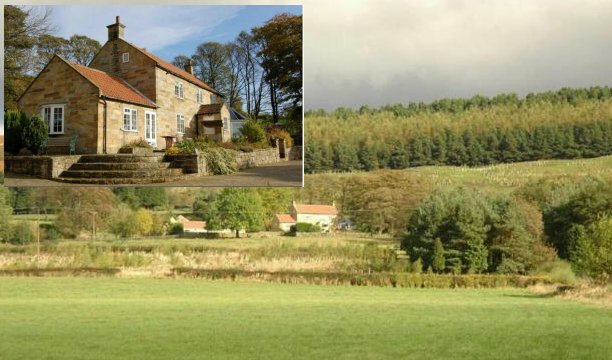 The couple eventually retired to St Joseph's Cottage, off Coach Road, Sleights. (2012 sales particulars.) 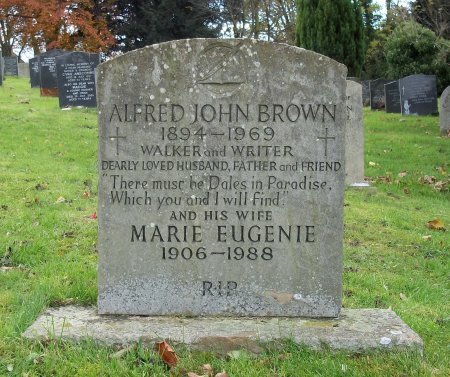 They are buried together in the churchyard - despite the fact that Brown was a staunch Roman Catholic (or adherent of "the old religion", as he refers to it in his book). The location of the plaque, in a spot whose isolation would encourage few visitors, has meant that the location has been spared the vandalism to be found at the Ship Stone. John White has confirmed that another well-known Yorkshire walking writer, Tom Scott Burns, fixed the plaque in place. Burns' wife, Mrs Denise Burns told Mr White that he received the plaque from Brown's wife in 1980 - he was given various items of memorabilia because he was planning to write a biography of Brown. Mr White wrote to me: "Subsequently Tom chose this spot since it was one of his favourite places, where he would sometimes camp at New Year. Tom chiselled out the rock in order to embed the plaque on the rock face and it was a place where Tom and his walking friends would often leave messages for each other." There is no reference in Brown's books to his ever visiting the spot - or indeed Tripsdale - with the exception of a single walk passing from Chop Gate to the Cockayne area. He "climbed up past William Beck Farm and struck the old track over the first ridge." This ROW immediately east of the farm, over Black Intake, is clearly an old track, as it is sunken in places. 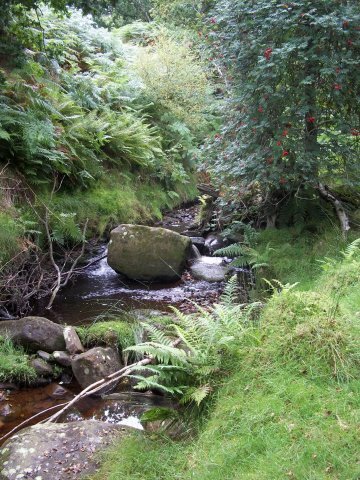 He then dipped "down to the first beck, crossing it by a flat stone ford", which will be the existing ford near the cobbler's cottage. 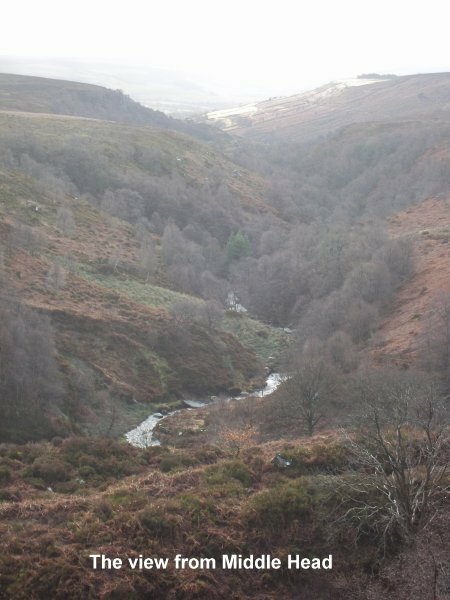 Brown climbed the next ridge, and lost the track - not a fate that would befall anyone today, as a shooters' road defaces the moorland. And that is Brown's sole recorded encounter with Tripsdale. 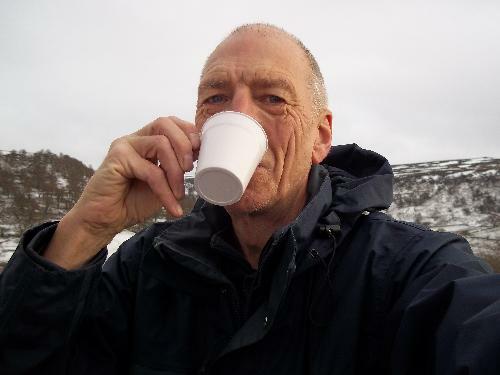 Although not a prolific author, Tom Scott Burns was widely respected as a writer on Yorkshire walking and countryside topics. He was also an admirer of the work of AJ Brown, and once planned to write a biography. Mr Burns, who lived in Nunnington, died in July 2011. In The Walker's Guide To The Cleveland Hills (Smith Settle, 1993) he describes Tripsdale as "a real gem in the crown of Bilsdale". 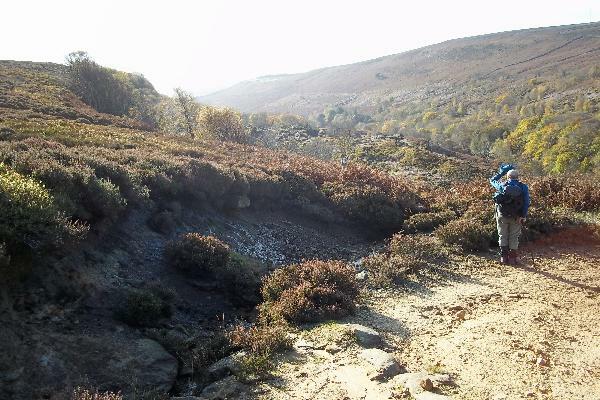 He denounces the shooters' road that crosses the dale as a "ghastly-constructed bulldozed track". Burns says Tripsdale is the haunt of the hawk owl, and that the "uncommon and beautiful" black redstart has been seen around old drystone walling. 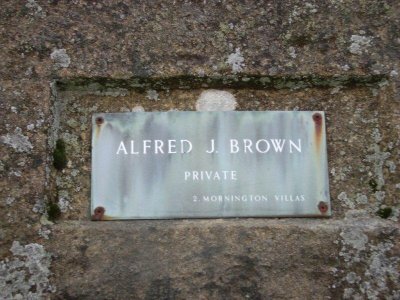 Burns was responsible for fixing AJ Brown's house plaque to the Low Cable Stones. I am told that Burns camped at the spot to see in the New Year, and left messages for walking friends there. His ashes were scattered around the Low Cable Stones, and at his family's initiative, a plaque was fixed there in his memory. The inscription on the Ship Stone. All things are full of the Creator. Jonathan Hart, man of Bilsdale, 1849. The link is to here. There is a strong Quaker tradition in the Bilsdale area,and I speculated initially that the sentiment of the inscription, that God is to be found in everything, seemed close to the Quaker view of the deity. However, I have since heard from Jonathan Hart's great-great-granddaughter, Barbara McLean, who lives in California. She has identified the quotation, which comes from Tertullian, the 3rd Century author of Latin Christian literature. 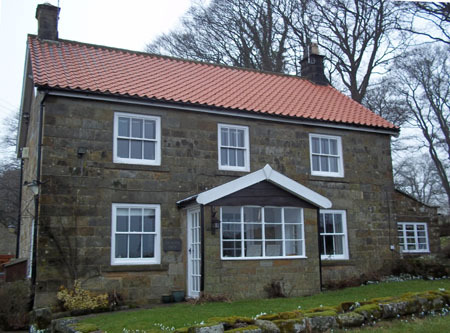 Mrs McLean tells me that Hart was born in 1824 at Oak House, just around the Nab End corner of Tripsdale, and was teaching in Ingleby Greenhow in 1861. Some time later he and his wife Margaret (née Taylor) left England with their son, William Patrick. In 1891 John and William were teaching at a Roman Catholic mission in Hawaii. Mrs McLean says that the story of John's apparent conversion to Catholicism remains unknown. She travelled to Hawaii Big Island in an attempt to find Jonathan Hart's grave, but the site has been lost to volcanic deposits and earthquake activity. It seems extraordinary that the final resting place of an 19th Century Yorkshire village schoolmaster should be beneath volcanic debris on a Pacific island. 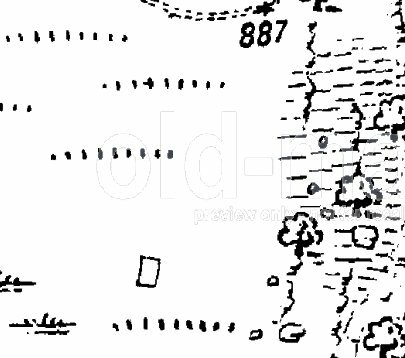 The map to the left indicates the relative positions of Oak House and the Ship Stone. Oak House was listed for sale in 2010, as a five-bedroom former farmhouse, at slightly over £1m, including a detached two-bedroom guest cottage, ten acres of land, a tennis court and a stable block. Below are the publicity photographs of the house. Tripsdale (Thripesdala) is said (1) to derive from the Old English "thripel" (instrument of torture) or "thripple" (movable framework fitted on a cart) and means, therefore, "valley with thripel/thripple". Ash Nuiken: The strangely-named area in Tarn Hole, means Ash Nook, "nook" in this context meaning a corner of a field or a road, so Ash Nuiken would mean "Ash Tree Corner". My thanks to Ms Atkinson for this contribution. The "en" suffix could indicate a plural (my speculation). Chop Gate (pronounced "Chop Yat, and often spelt that way in 19th Century documents), means "peddlars' way". 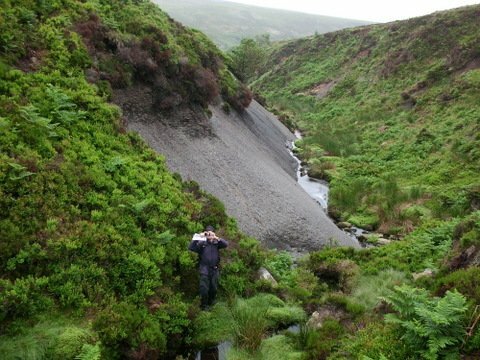 In the mid-18th Century, a disgraced Quaker, Joseph Foord (he was expelled, aged 30, for fathering an illegitimate child) organised a project to dig water channels from the northern dales to limestone areas where water supplies were prone to dry up. The Tripsdale race originally started at 582200 989800 (just north of the ford) but..."The alignment was subject to some changes and alterations during its lifetime - the Tripsdale section of the race had to be abandoned after the 1870s as a result of jet mining which had undermined some lengths and blocked others with spoil. 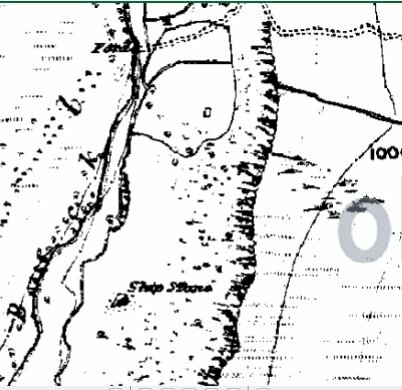 As a result, the Ordnance Survey map of 1892 shows the race as starting from a weir on Tarn Hole Beck (SE59049770), although it is possible that water was still brought from the Tripsdale Beck to a small pond above the weir." 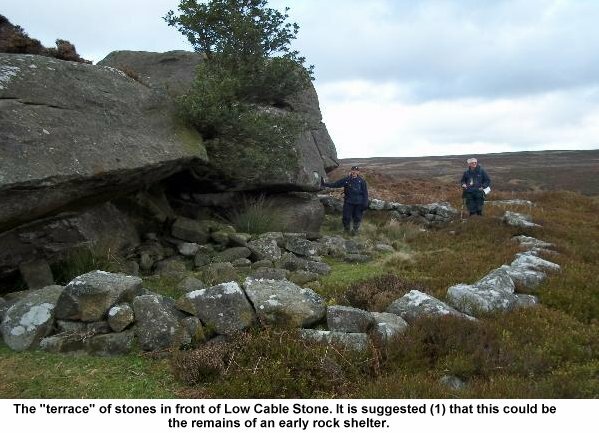 - National Park archaeological excavation report, 2009. 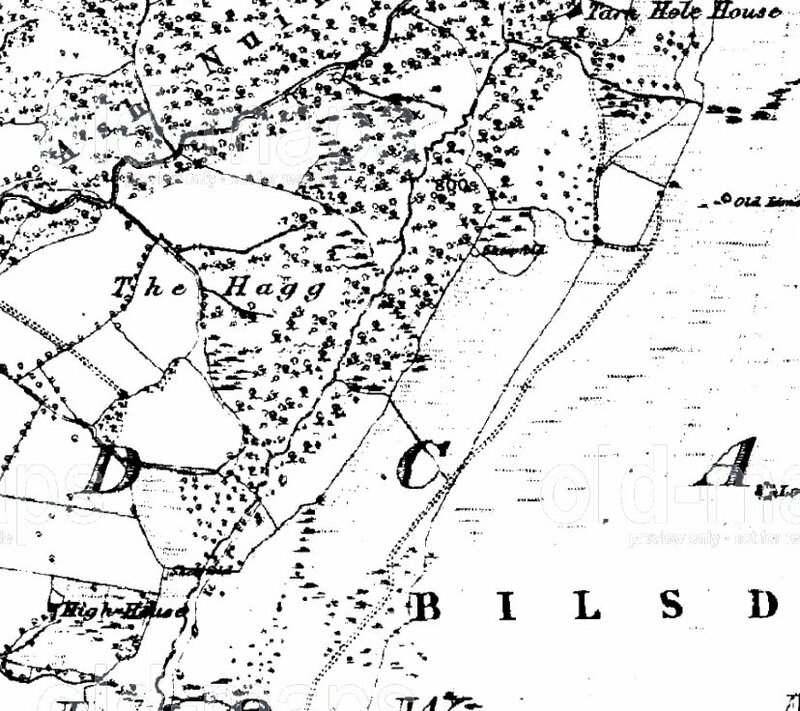 Below is shown, on an 1857 map, the source of "Rievaulx watercourse" in Tarn Hole, just south of Tarn Hole House. Hagg House was then called High House. The track that runs north-easterly, stopping at a field boundary to the west of "old mines" appears to be the public footpath that exists today. Two weeks after a visit to Tripsdale, I was astonished to discover (2) that I had been within a few yards of a working water race, probably constructed by Foord. This runs for a mile from Preston Spring (SE57819846) to Hill End Farm. According to McLean, in 1997, 1,000 pigs were being raised at Hill End, with the home and business entirely dependent on the supply. The water is so pure and clean that it was not until the early 1980s that the farmer was obliged by European rules to filter it, as he had decided to start offering bed and breakfast accommodation. 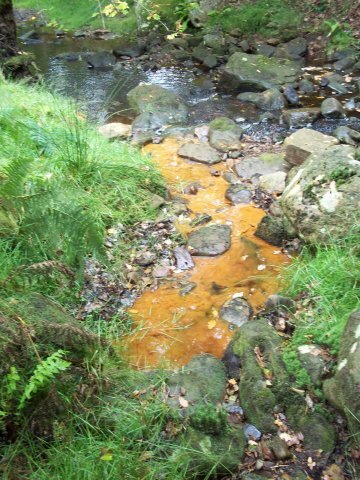 When I visited Tripsdale on 2 January 2011, I walked through the yard at Hill End Farm, and it appeared that the water from the race was now running to waste. However, two years later, I finally managed to speak to someone at the farm, who told me that appearances were misleading. Hill End's large piggery is still completely dependent on Joseph Foord's race, as are the human occupants of the farm itself and two nearby houses. From the farm, I followed the public footpath north-east, which runs for a time beside the water race. This was in exceptionally good condition, and the experience of walking beside a functioning 18th Century water race was very rewarding. 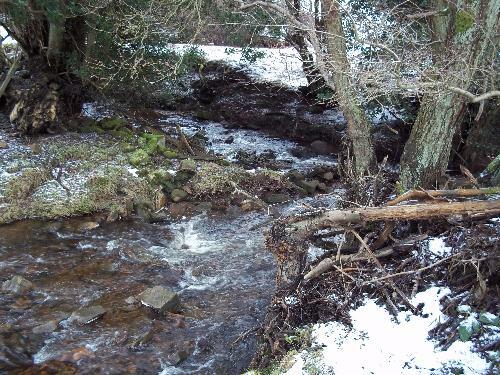 Tarn Hole is the tributary valley that joins lower Tripsdale to the south of Hagg House, with Tarn Hole Beck and Tripsdale Beck uniting to become Ledge Beck. Regrettably, the interior, bordering the stream, has no public right of way and is excluded from the open access land. However, at least one rock-climbing site regards the route beside Tarn Hole Beck as a legitimate means of access. There are many disused jet mines, with drifts of up to 300ft being cut into the banks. It is thought that a glass furnace may have operated in the valley - Tom Scott Burns records in one of his books that a former resident of Hagg House showed him samples of crude glass that he found in Tarn Hole. 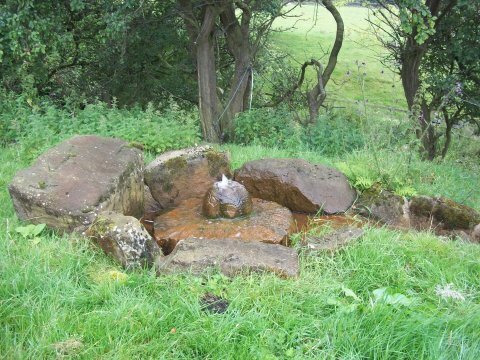 Joseph Foord relocated the source of his water race to Riveaulx in Tarn Hole after the original source in Tripsdale succumbed to subsidence. This crossed Tarn Hole Beck on a wooden viaduct. One of three known ancient routes into Tripsdale from Bilsdale, the others being via William Beck and Seave Green - the Friday fish for the monks of Rievaulx Abbey was brought from the Tees ports via Seave Green. (1) I finally walked this route on 10 July 2013. The name of the Badger Stone (on the moors east of Tripsdale) is a corruption of "Bacheler" - origin unknown - and therefore has no relevance to any resemblance it might bear to a badger. It is on the site of the junction of two of the area's major roads (Magna Via) from at least the 12th Century, when the floors of valleys such as Bilsdale were virtually impenetrable forested swamps. 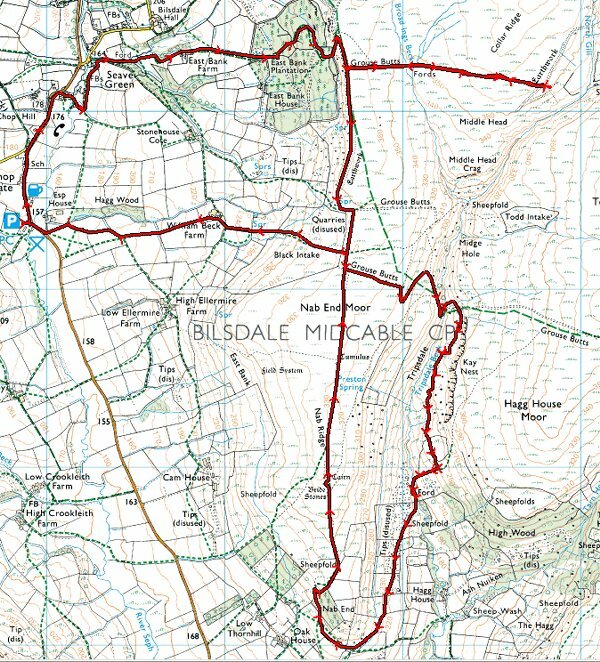 One branch of the road passes through "Thriplesdale" to "Willelmesbec" (William Beck) and across Bilsdale. 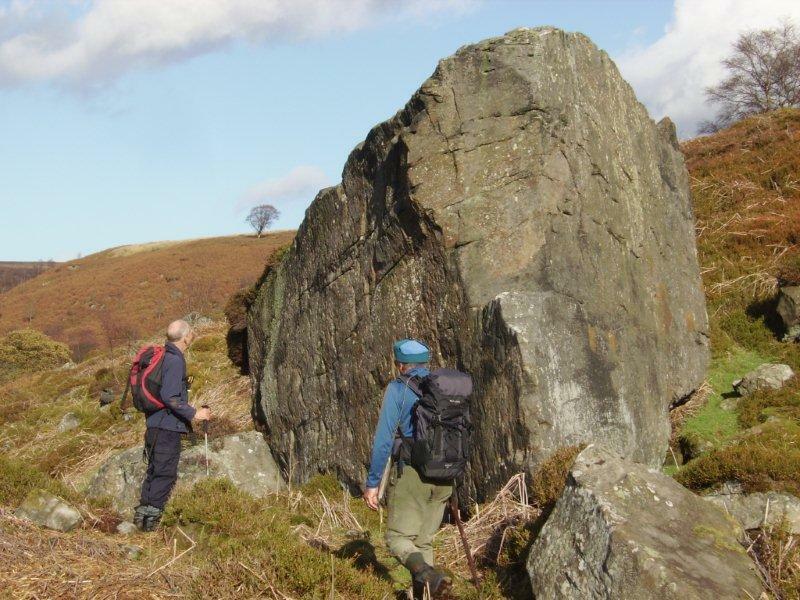 Rock climbers are attracted to pitches in Kay Nest and above High Wood, which lies between Tripsdale and Tarn Hole. 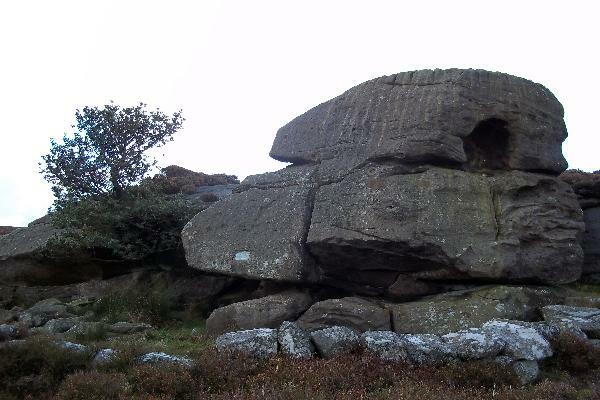 ukclimbing.com describes a pitch called The Arete at Kay Nest as "The Holy Grail of unclimbed Moors problems." The recognised approach appears to be along the west bank of Tarn Hole - which is private land. An informative page has been archived. 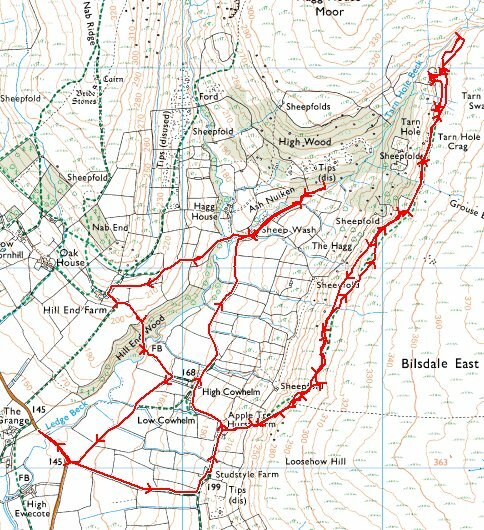 Bridleway: I queried the plan to divert bridleway 515 south of Medd Crag. 1.11.10: Karl Gerhardsen replied from NYM, stating that the bridleway would not be diverted, because of objections. Work to the ancient dyke will allow users to follow the legal line. (1) A History Of Helsmley, Rievaulx And District, McDonnell (Ed), Stonegate Press, 1963. 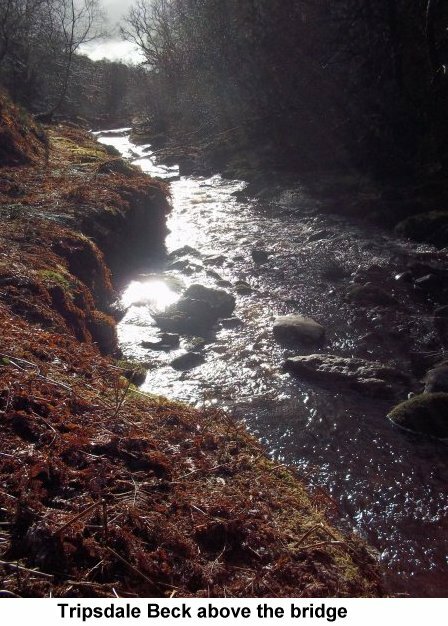 (2) Water From The Moors, The Life And Works Of Joseph Foord, McLean, NYMNPA, 2005. Wednesday group, with Les and Bob. I had looked into Tripsdale during a previous walk and was intrigued by it, even more so after reading about the Ship Stone, a 1500-ton rock on which a 19th century schoolmaster had inscribed a Latin message. Directions to it were vague, and there were recommendations that one would fare better when the bracken was low. I devised this 11+ mile route from Chop Gate, to go over the ridge and toy with Tripsdale before descending into it and making our way along the valley. En route, we visited Round Hill (at 1500ft, the highest point on the North York Moors), Cockayne Head, and the Badger Stone (NZ 604 004) - above and below - before skirting to the north the climbers' face of Kay Nest, and reaching Tripsdale Beck. 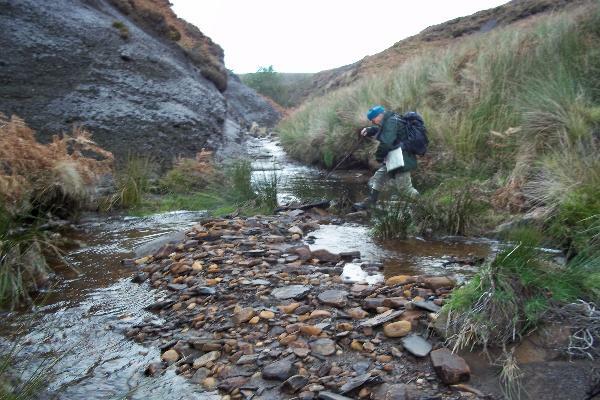 Here, we began by following the stream, then worked our way back up slope in search of the Ship Stone. Consulting our Memory Map route later, it became clear that we could more easily have begun by leaving the shooters' track at a big bend (which does not appear on the OS map) at 583 988 and heading slightly west of south. However, once we had left the stream, it was very easy going underfoot, and we soon located the Ship Stone (the 10 figure NGR, for those with GPSs and/or Memory Map is 58226 98640), which was unmistakable, although I have serious doubts about its supposed 61ft length. We wondered why there had been such dire warnings about accessibility, but the story to the south was very different, with tall bracken and marsh. A clear path disappeared without trace after we crossed a tributary stream, and we wandered about in search of a path, eventually descending to Tripsdale Beck. 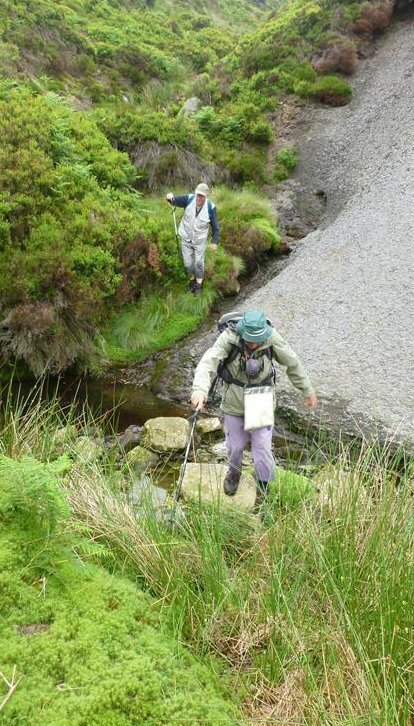 Here, I fell into the water, and Bob and Les crossed with difficulty, and we decided that the best course was to head directly west uphill out of the dale, to gain the good north-south track along Nab Ridge. This was a really exhausting haul, occasionally pulling ourselves up by grabbing clumps of bracken. From the vantage point of Nab Ridge, we decided that we would have had a much easier passage if, instead of descending to the stream, we had moved south along the base of the treeline on the east of the dale, to encounter the path that descends from above Kay Nest, possibly encountering it at about 581 979, then following the right of way as it swung west around Nab End, to join our eventual route at 573 973. It was, however, a memorable day out, and I intend to return soon to test out a better southern approach to the dale. I also want to find the remains of the cottage used by the cobbler who, it is said, used to walk in to Seave Green on Sundays to sell his wares from outside the inn. View down-valley from the Ship Stone. Bob watches Les cross Tripsdale Beck, shortly after I came to grief. Wednesday group. With Bob and Phil, who took several of the pics below. Bob and Phil accompanied me on a terrific walk. In Seave Green, we tried unsuccessfully to identify the property that was once the Fox and Hounds Inn. We then headed up and over East Bank before following a shooters' track east until it petered out. 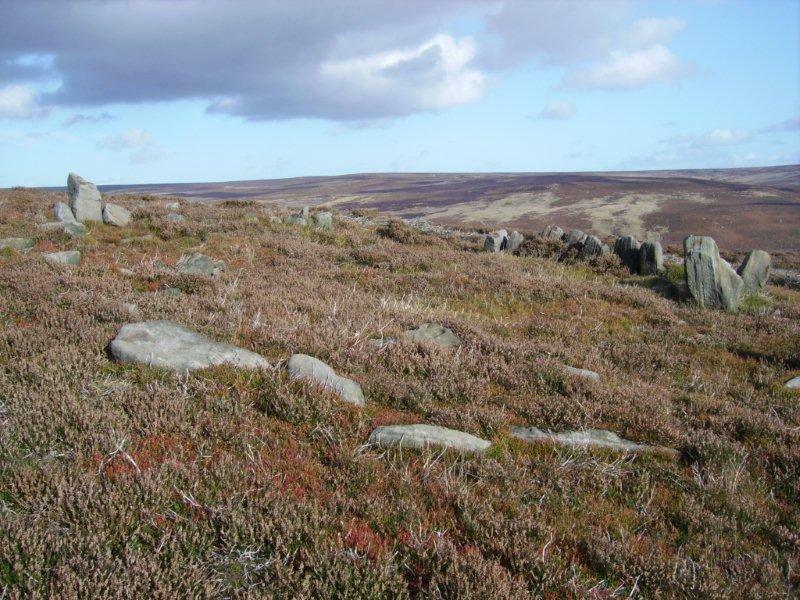 We went further east through heather until we encountered Low Cable Stones (left), an impressive outcrop on which a plaque commemorating Yorkshire walking writer Alfred J. Brown had been fixed. This is said to be the plaque from his one-time home in Bradford, and because of the isolation of the site, few will be aware of it. Next we continued east and descended into the canyon-like valley of upper Tripsdale. This was a real adventure, requiring us to switch frequently from one side of the stream to the other, clambering over fallen trees and rocks, forcing a way through bracken and heather, stepping gingerly on submerged stones, and at times resigning ourselves to the inevitable and splashing into the stream. The mile-long trip proved to be quite a challenge, and we all took a few tumbles. It seems unlikely that many (if any) other people make their way down North Gill in a typical year. I was happy to emerge with only a grazed scalp (typical inability to judge the space under a branch) and a bruised and grazed knee (result of several falls). Having taken time to draw breath at the shooters' track ford, we headed east steeply uphill, then south along the edge of Kay Nest, following a distinct path presumably made by rock climbers. The sites of the cobbler's cottage and the Ship Stone were identified, and we saw a promising line for our passage from south to north through the main valley. This did prove to be worthwhile, as we moved north, first through a derelict stone enclosure, then following a very faint (and occasional) path through bracken, until we crossed a small east-west stream onto ground that was familiar from our previous expedition. Phil was introduced to the Ship Stone, and we then continued to the cobbler's cottage. We headed north-west steeply up hill on the shooters' track, before picking our spot to move south-west over the heather-covered hillside, where the side of a wall seemed to provide the best means of progress. 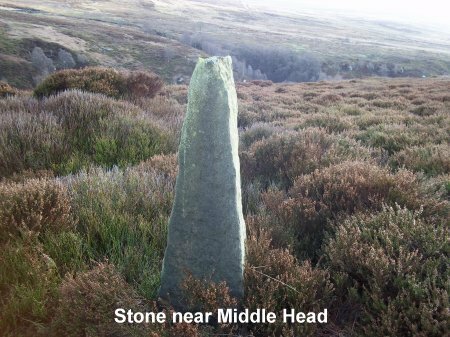 Eventually we struck out directly for the track along Nab Ridge, visited the Bride Stones, then retraced our steps along Nab Ridge, hoping to find the top of a reputedly ancient sunken track that mounts east bank. (Dotted line on map above.) This was not evident, so we continued to the path down to William Beck Farm before returning to Seave Green. 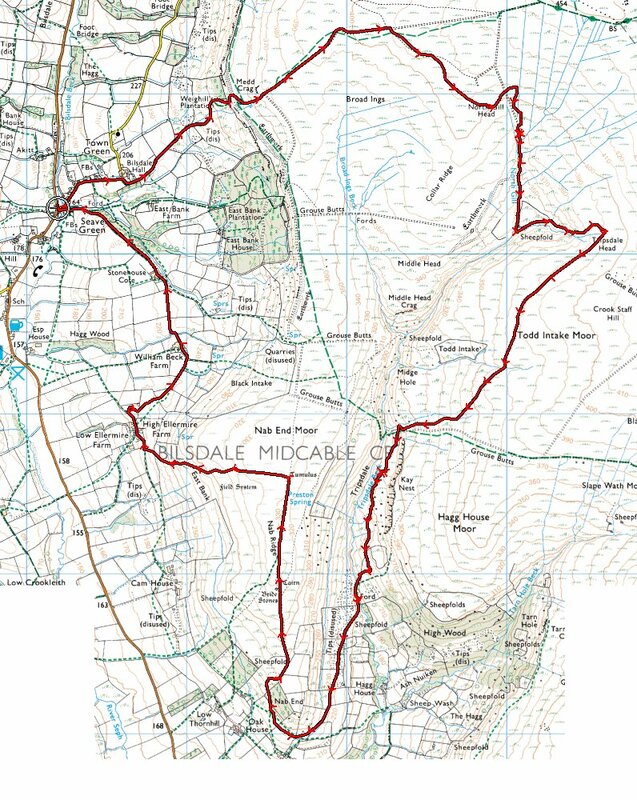 This was a solo trip to see Tripsdale under the remaining blanket of snow, which I made with the intention of walking along Tripsdale from its entry into Bilsdale via Cowhelm and Hagg House. Unfortunately, no public right of way exists close to the floor of the dale beyond Hagg House, which effectively sits across the route. I also walked a short way up the (non-public) track towards Ash Nuiken, before meeting a closed gate. 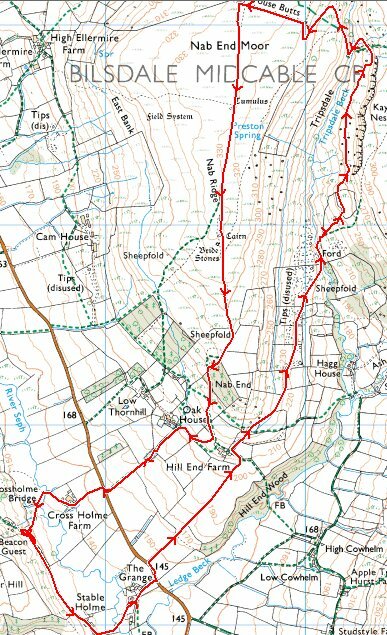 Back near Hagg House, I began to walk west up the public track to Nab End, but at a practical point struck off directly north across fields, walking parallel to the beck. Eventually, I could no longer resist the pull of the beck, and I headed closer to it, before becoming lawful again by intercepting the northbound right of way. This soon met the ford, the southern crossing of Tripsdale Beck, which I was seeing for the first time. The photograph below does not convey the hazards of this crossing. The stream was running fast, and the stones were very slippery, so I was concerned about the possible consequences of getting a soaking in such cold conditions, in an isolated spot. 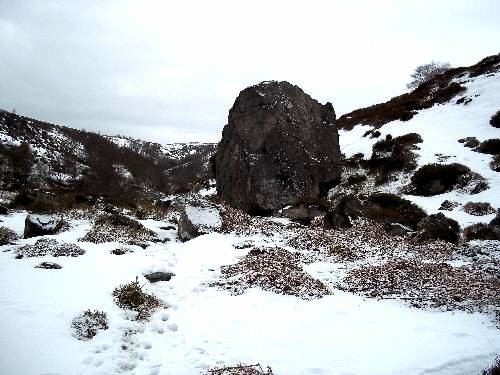 In the event, with great care I managed to cross safely, and began a very strenuous passage of the lower end of the dale, ploughing through snow and piles of decomposing bracken, to the Ship Stone, where I had coffee. 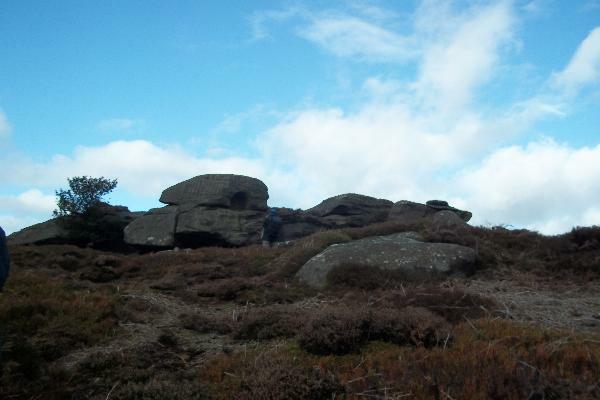 I stuck to the shooters' track to get me uphill to Nab Ridge, then went south to the Bride Stones for a lunch break. From Nab End, I descended to Hill End Farm to check the water race (described under the Water Race notes above). I had intended to branch off along the footpath to Hagg House, but Tripsdale exerted its pull again, and I found myself heading north to tick off another length of public right of way, before swinging south to retrace my earlier (unauthorised) steps through fields to Hagg House. Exit was made via Hill End Wood to complete a very satisfying day. This is not intended to be a suggested route for anyone else - it is a record of a solo walk in which I followed a loosely formulated programme, allowing me to follow my whims. The weather forecast suggested that occasional showers would clear and that the day would become brighter, but because of the heavy downpour, I changed my mind about parking on the verge at Seave Green, and walked in from the car park at Chop Gate. My initial wish was to identify and photograph Riveaulx Cottage (on the site of the former Fox and Hounds, which was frequented by the Tripsdale cobbler) in Seave Green, but because of the heavy rain, I did not want either to linger or get my camera wet, so this was left for another day. I took the steep route out of Seave Green via East Bank Farm, then made my way over Broad Ings to Low Cable Stone, where I had coffee, and drank a toast to AJ Brown. 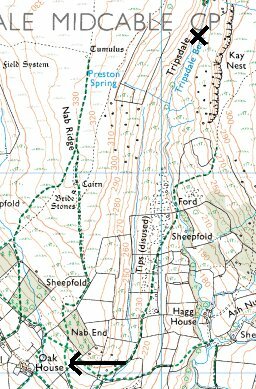 My original plan was to walk along the earthworks to Upper Cable Stone, then cross North Gill and attempt to walk via Tripsdale Head to join the public footpath on the east ridge above Tarn Hole. However, the North Gill canyon is so steep that I realised that this would be foolhardy while I was alone, particularly in the driving northerly wind and rain. Instead, I decided to check if there was a simple high-level route out, above the west bank of Tripsdale Gill. At first, the going was fairly easy, across fallen bracken, but Tripsdale is rarely kind for long. Soon, thick heather made the going tough. From Middle Head, there was a superb view along Tripsdale to Bilsdale, and as the rain had stopped, I tried to take a photograph. Immediately, the biting wind started to drive tiny droplets horizontally, effectively making an aqueous mist. I put my camera away hurriedly, and the weather eased off. I took out my camera, and this time, driving wet snow started hurtling across the land. I had to turn the corner to find a way across the Broad Ings Beck tributary, which is in a steep-sided cutting. As the bank was sheltered, the heather became more luxuriant, and walking even more tiring. Eventually, I slid down the bank, crossed the stream and scrambled up the far bank, into yet more heather. Eventually, the going became a little easier, and I reached the shooters' track, descending it to Tripsdale Beck. I walked upstream a short distance to inspect the original source of the Riveaulx Water race (before it was relocated to Tarn Hole to avoid subsidence problems). The weather was too bad to allow me to take out my camera. I moved on to the Ship Stone, where I found some shelter to have lunch. The heather and flattened bracken were tolerably passable as I went south, and the weather seemed to be improving. 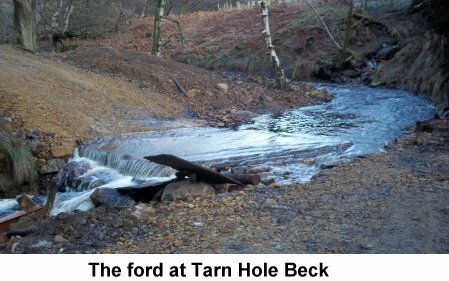 I trespassed into Tarn Hole, to have a look at Ash Nuiken (unremarkable fields) and paddled through the rushing Tarn Hole Beck ford. I continued along the private track to the bridge near Hagg House, where I became legal again. Unfortunately, there was once more no one in evidence at Hill End Farm, so I was unable to ask about their use (if any) of the water race. Near Low Ellermire Farm, I thought I had identified the lower end of the East Bank Rise, the lost ancient path up to Nab Ridge, but on consulting my map and GPS at home, I see I was about 50 yards out. One for next time. I returned to the car very weary, after one of the hardest walks - but an extremely satisfying one - I have experienced while we have been in Yorkshire. We first identified and photographed Riveaulx House (the former Fox and Hounds Inn). On a very misty day, with little visibility, we visited Upper Cable Stone for the first time. The AJ Brown plaque at Lower Ship Stone was cleaned. Then we walked via Middle Head Crag to the Ship Stone for lunch. The ford was much too full and deep, so we exited via Tarn Hole, visiting Hill End Farm and Oak House en route. In and out to Lower Cable Stone, Nab Ridge, Kay Nest, back to Ship Stone for lunch, Nab Ridge, exit via Hill House Farm, Oak House. Mainly fine weather with good visibility. I finally found an opportunity to have a better look at Tarn Hole, Tripsdale's final downstream tributary. It has a history of jet mining, and possibly even glass production. Foord sourced his longest water race from Tarn Hole when the original source in Tripsdale suffered from subsidence. 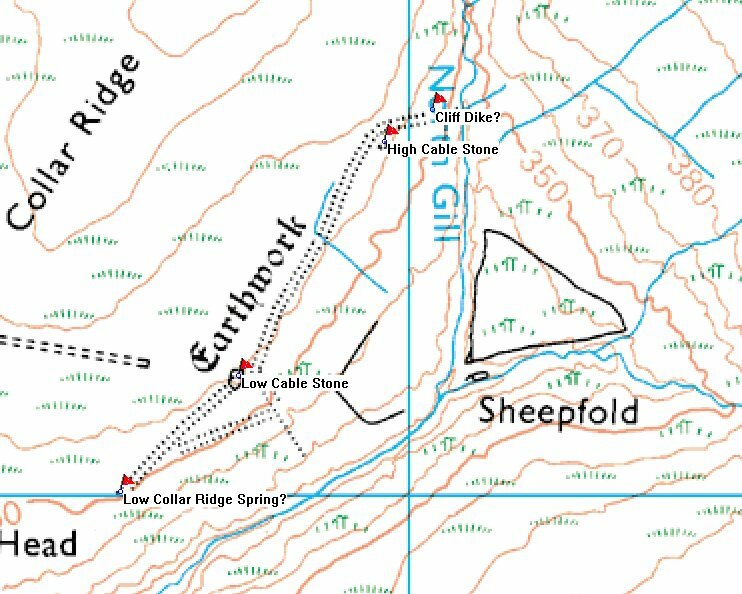 I intended to walk along the footpath shown running orth along Tarn Hole Ridge, then find an opportunity to descend over the private land to the beck, and follow that downstream. However, the public footpath proved to have no substance on the ground, and I had a very tiring struggle through heather. Descent to the beck was impossible, as I was fighting 6ft-high, tangled bracken down a 45 degree slope, with many hidden potholes, so I returned through more heather, cranberry and scrubby birch. 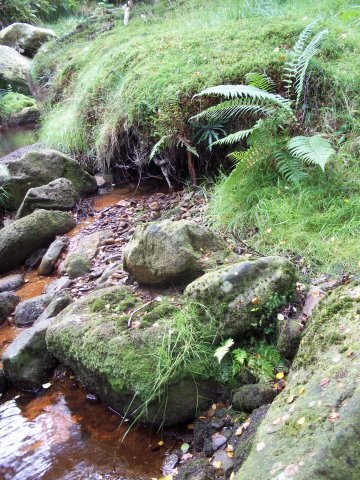 I walked to the Hagg House junction, then followed the beck past the ford. 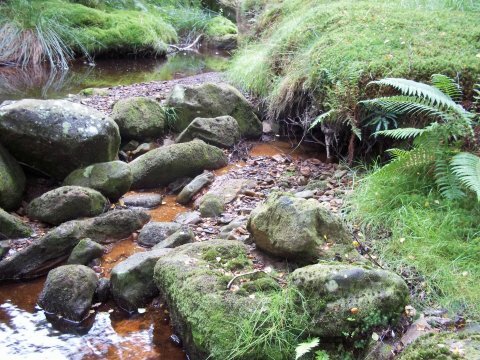 I found a couple of seepages of vivid red-brown water, more suggestive of iron than jet, but turned back, as the stones in the stream bed were very slippery, and I was on my own. This was a long-awaited treat, in the form of a trip to see the canyon and headwaters of Tripsdale Beck. I approached from Urra, using a bridleway that had the potential of offering the least trying access to Tripsdale, but the way became choked with heather and proved quite irksome. The possible route towards North Gill Head was not evident on the ground, so I continued east along a shooters' track, with the intention of taking an offshoot of the track south. I overshot the turn, and went a kilometer out of my way, and had to return to the offshoot after being splashed with mud by an ignorant estate worker in a speeding 4*4. 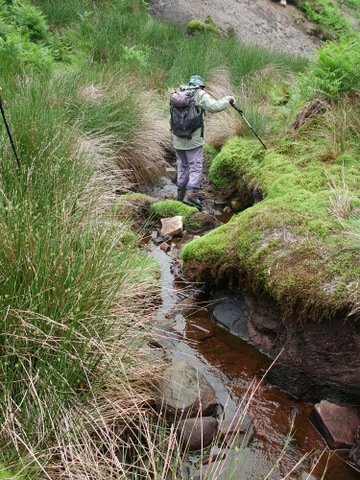 The left-hand fork of the offshoot, along North Gill, was unmaintained and very soggy, and I eventually descended into the streambed. After checking out one of the constructed drains, I eventually scrambled out of Nortn Gill and headed for High Cable Stone, then followed the earthworks towards Low Cable Stone. From there, I spent some time inspecting the far side of the dale, looking for signs of a useful north-south line towards Kay Nest. The heather did give the appearance of being thinner on the higher slopes. I descended to North Gill and scrambled up the other side to the sheepfold, from where I followed Tripsdale Beck upstream, and crossed three feeders. At this point, very close to Tripsdale Head, I turned towards the beck and made a scrambled crossing. After trying the make progress southwards at various levels, I felt that after the exertions so far, another three-quarters of a mile of floundering through heather, stumbling into hidden holes, would not be among my most pleasurable experiences, so I stumbled, scrambled and slithered down to the stream, where I discovered - for future reference - a well-graded route up to the sheepfold. I was about to being climbing the western bank when I saw sheep disappearing around the next downstream bend, and wondered if they were moving towards a better route on the western side of the river. In fact, they were, and an easily negotiated shelf led me up. I thrashed up to Low Cable Stone and had a relaxed lunch, out of the wind, and enjoyed the solitude. When I got up to leave, I turned towards the stone and saw a new plaque, commemorating the life of Tom Scott Burns. I walked back along the east-west earthworks to join the shooters' tracks taking me east, then south, and used one of the paths past Stonehouse Cote for the first time. 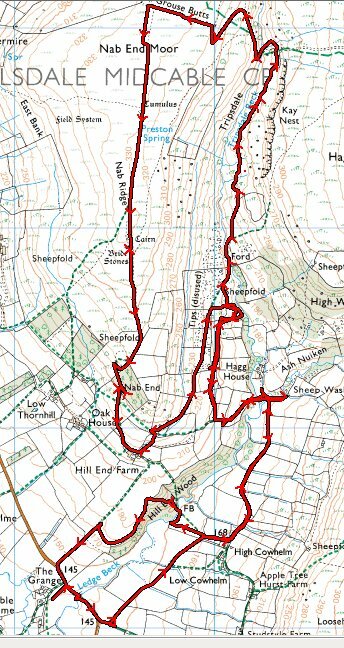 From there, I went through Town Green to Urra, and followed the line (not entirely accurately) of the blocked right of way past Holme Farm. As usual, Tripsdale did not give up its secrets easily, and I was absolutely whacked, after an eventful and adventurous 10.4 miles. Walked in preparation for inclusion in book. The ford was very high, so I crossed on a fallen tree. Easy journey along the dale to the Ship Stone, as the bracken had not started to grow. Lots of snow remaining. My daughter Louise, who was camping with her boyfriend Paul Beal at Great Broughton, requested an introduction to Tripsdale,and of course, I was happy to provide it. My wife Maureen also accompanied us. We walked in from Seave Green and first visited Low Cable Stone, where I cleaned the Tom Scott Burns plaque as best I could with my handkerchief. After the shooting track from Nab Ridge ran out, the route along and beside the earthworks was surprisingly wet — most areas have now dried out very well after the downpours earlier in the month. We returned to Nab Ridge and followed the popular shooting track down to the bridge over the beck, then inspected the cobbler's cottage and the Ship Stone. I decided to press on southwards. 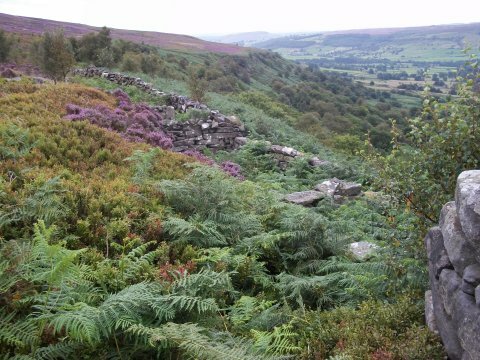 Once again, it was very wet underfoot in places, and the bracken was thicker and taller than I have ever experienced it in this part of the dale — up to 6ft high. The public footpath in the holloway down to the ford was very squelchy and unpleasant, with reeds about 4ft high, and giant bracken to either side. The ford was quite low, but a lasting solution is needed here. On the far bank, a collapse has led to the need for a scramble up a bank, and the two ladies fell heavily after slipping on a rock at its foot. 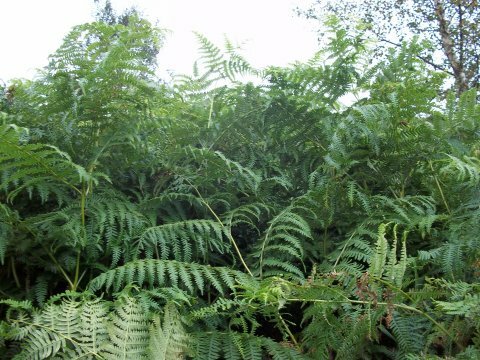 The path onwards towards Hill End Farm was very difficult, presenting a solid wall of tall bracken. I have never seen it in that condition before. Matters improved when we swung round to climb to Nab End, and we exited via William Beck Farm. Negotiating the public footpath down to the ford. The scramble to the ford. 9.3 miles. With Bob Clutson, Phil Trafford and Jim Horlock, I filled in three gaps. A visit to Tripsdale Head was followed by a transit of the east ridge south from the dale head, then a walk down East Bank Rise, the lost approach to Tripsdale from near High Ellermire Farm. We made an easy approach in mild, cloudy conditions from Bilsdale Hall, then followed the bridleway north-east, with the original intention of taking the shooters' track south from 590 015. However, we cut the corner along a minor path running south-east from 583 014. When the path became indistinct, I veered more south than intended and made a messy approach to near North Gill Head. We stopped for coffee and the clouds began clearing, opening up the view down North Gill towards Tripsdale. 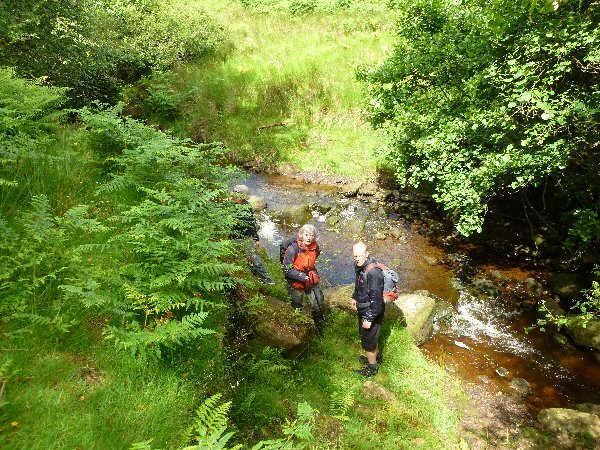 We descended to the gill and scrambled along the banks to the junction with Tripsdale Beck. Having walked up to the sheepfold that overlooks the confluence, we walked above the stream to Tripsdale Head. The walk south through heather followed, via the headwater of the stream feeding Midge Hole, after which we descended to visit the Cobbler's Cottage and the Ship Stone, where lunch was followed by a doze. From Nab Ridge, there was no sign of the top end of East Bank Rise in the heather, but we walked accurately along a GPS route, until after a couple of hundred yards, a definite route - at times a holloway - became apparent a few yards north. Althugh this was occasionally faint, it was followed accurately to the edge of the open access land, then across a short patch of field to the path's conclusion. 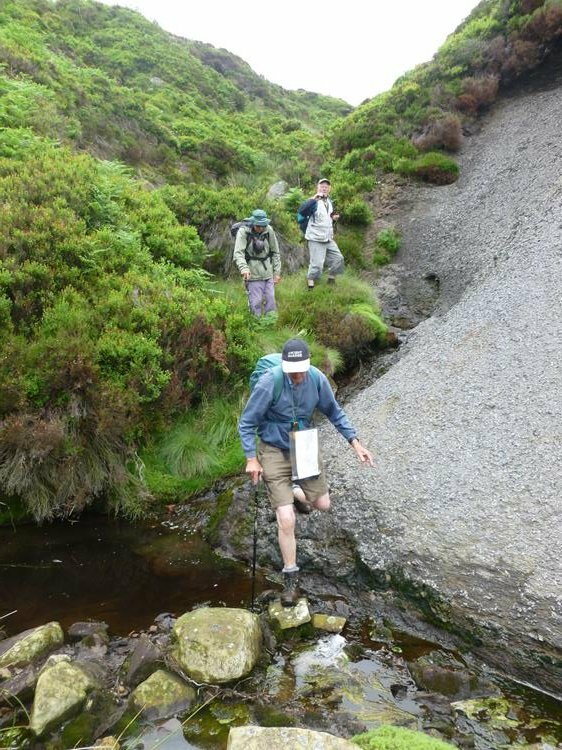 Above, and next two photographs: A careful descent to the headwaters of North Gill. Above: Easier going in North Gill...for the time being. Below: Lunch at the Ship Stone. Above: Crossing the ford in Tripsdale Beck. The water level is very low, but several of the stones were very slippy. Below: Cotton grass beside the track on Nab Ridge. Above and all pictures below: Following East Bank Rise.